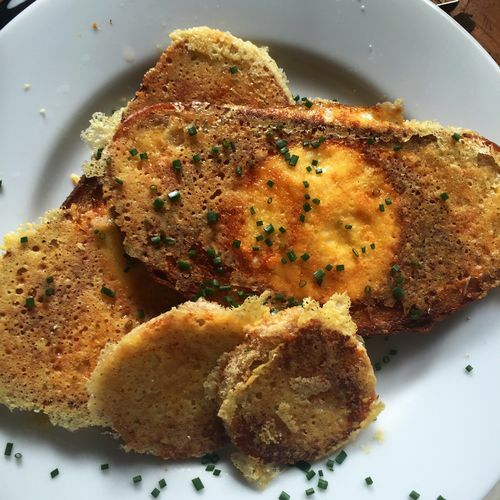 Egg in the hole meets my favorite grilled cheese! I started by cutting a hole out of and buttering a couple slices of bread and shredding up a combo of extra sharp cheddar and Parmesan. I made a layer of cheese in a preheated skillet, laid the bread over it and cracked the egg into the hole and seasoned it with salt, pepper, and plenty of smoked paprika. Let the egg and bread cook for a couple minutes until the cheese was crispy and golden, then I scooped the bread out, made a new layer of cheese in the pan, and returned the bread to the pan, uncooked side down. Once that side was beautiful, I topped the whole thing with chives from the garden because everything is better with alliums. How else have you turned the egg-in-a-hole on its head? Tell us in the comments.